Heart shaped candy boxes, dishes or artwork are always associated with Valentine’s Day, but what we should really be wondering is how healthy is our or our loved ones own heart! It is no coincidence that February is Heart Health Month and not to be a buzz kill but the number one killer of Americans is heart disease! It is also the most preventable disease…unless there is a genetic defect…basically a healthy diet with exercise can reverse this condition. It seems that when or should I say IF one survives their first heart attack (1 out of 3 won’t) is when that person changes their diets and habits. But why wait?? One of the things we HAVE to do is start with our children. The kids today have cholesterol levels as high as adults and 1 out of 3 American kids and teens are obese, the number one cause of heart disease. You cannot feed your kids chicken fingers & fries, pizza, mac n’cheese, grilled cheese & fries and hamburgers & fries (all items usually available on the kids menu of any restaurant) and expect them to turn 18 and eat vegetables! The following are simple changes that are easy to make but make a big difference. 1) When you eat chicken, meat or pork for a meal, instead of a huge portion, just have a side dish size; 2) Add vegetables to every meal; 3) Substitute brown rice for white rice and eat often; 4) Add steel-cut or rolled oats to your breakfast options (oats lower your cholesterol); 5) Substitute mustard or Vegenaise (a dairy & egg free product) for mayo; 6) When you order a sandwich request no cheese but add as many vegetables as possible; 7) Use whole-wheat pasta instead of white pasta; 8) Always order a marinara or olive-oil based pasta sauce instead of an Alfredo or cheese sauce; 9) Substitute beans for meat for burritos or nachos; 10) Start having Meatless Mondays. 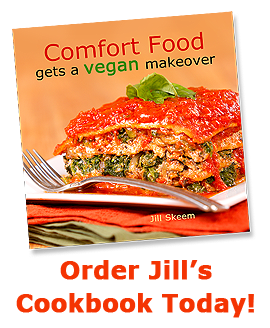 There are so many great vegan recipes out there (my cookbook has many! ), find a new recipe and make a vegan meal for you and/or your family. Making these changes and really thinking about your loved ones’ heart is how we truly should celebrate Valentine’s Day! Check out my latest episode, How to get your child to eat healthier food! on my podcast, Eating Well & Staying Healthy, on www.webtalkradio.net for some more great ideas on how to feed your kids healthier! The book is beautiful. I love the way all the recipes look effortless and delicious... and that you included all the macro- cooking styles and ingredients (without referencing them directly). I'm very excited to share this with people.